Annique's Ultra Hydrating Lotion recharges the Moisture levels of the dry skin but leaves a more matt finish. If your skin is just a little on the dry side but you do not always necessarily want a rich moisturising cream. Right? You want hydration and moisture that last all day long but you like a lighter fast absorbing cream that won’t irritate your skin. Well, let us introduce you to Annique’s Hydrating Moisture Lotion that will do just that. It is light as a feather and it keeps moisture levels at an optimum during the day. 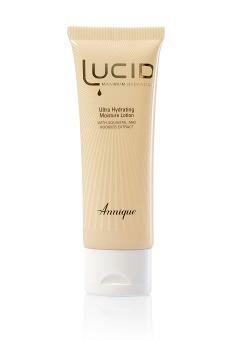 Like the other Annique Lucid products, Lucid Hydrating moisturiser contains Rooibos extract and Aquavital that add excellent moisture and anti-ageing benefits to the mix keeping your skin ultra moisturised all day long.